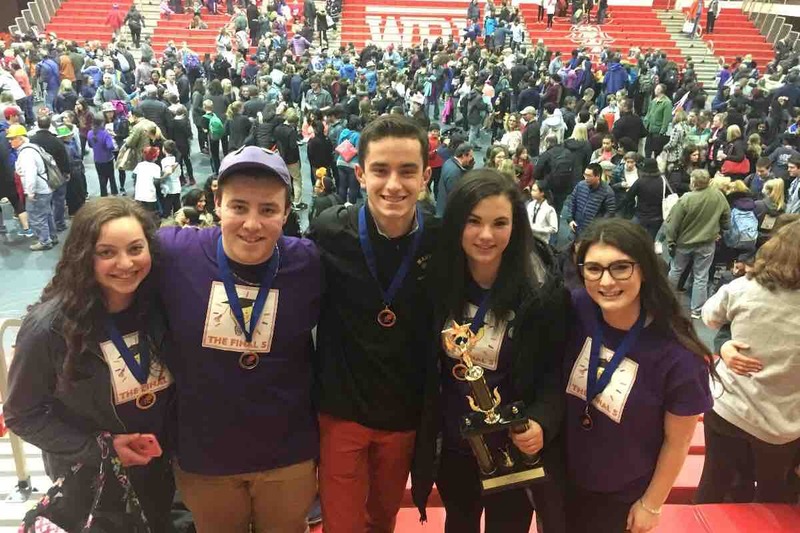 We are the Nauset Regional High School Destination Imagination Team, a group of five local senior students who will be representing the community at the international competition on May 23-26. Destination Imagination (DI) is a team-based, creative problem-solving program in which students from across the world come to compete in project-based challenges at local, state, and international tournaments. Challenges can be scientific, theatrical, or service-based, prompting students to work together in establishing collective solutions. This year, our team participated in the service challenge with a goal of promoting DI in our local community, as DI participation on Cape Cod has slowly declined in recent years. To address this issue, we partnered with Eastham Elementary School (EES), who helped us start a DI program for second graders in order to achieve our project goal. This past March, the young team from EES attended the regional competition at Dennis-Yarmouth Regional High School, showcasing a solution to their own challenge before the judges of the DI program. As managers of the young team, we were able to instill the foundations of the program at EES, hopefully inspiring more teams to participate in DI in the future. Our high school team also competed at the same tournament, presenting our work with EES in a theatrical presentation before a panel of judges. Utilizing the results from our project, we composed a fictional story representing our work in which we created an original script, set, and costumes to perform at the competition. We won first place at this tournament on March 10th, qualifying for the state competition on March 24th at Worcester Polytechnic Institute. We then presented our work at states, again winning first place, qualifying our team for Global Finals at the University of Tennessee from May 23-26. Our team plans to leave for Knoxville, Tennessee on May 22, and return to Cape Cod on May 27th after three days of competing. The ability to attend the tournament is a great undertaking, requiring the transportation of all props, team members, and chaperones to the site. The cost per person for participating in the event is approximately $1000, including all travel, food, and lodging for the duration of the competition. In total, it will cost approximately $8,000 for our team to compete, including the five team members and at least two/three parent chaperones. While we are excited for the trip, the cost of attendance is currently an obstacle for competing at the tournament, and we would be grateful to receive financial assistance in order to attend. We are accepting donations throughout the months of April and May in preparation for the event, and we are hoping to gain your support and encouragement as we go on to represent Nauset on the international stage. Thank you for your consideration.